For the past few months, before the massive outpouring of the 25th of Jan, Tahrir lived the ugly reality of being a square forced to watch, silently, its own people split. The revolution, with it first wave of activists, brought to the scene a bunch of revolutionaries who’d just read way too many books. They got too attached to Tahrir, such that it became an isolated entity with too many spokesmen, leaving average people confused and with nothing to turn to but the State TV and its lies. On another level, many of the activists became BFFs with their Facebook updates and achieved celebrity status through their tweets. Some made it through donning their best Gucci sunglasses. “The revolutionaries were too noble. They took the position of the hero eschewing power,” said Mohamed Abbas, an ex-Muslim Brotherhood member, as we walked down Tahrir a month ago (Abbas left the organization to found a new political party). After Mubarak left us, revolutionaries split into three groups: One got locked in its Facebook/Twitter fantasy world; the second, disgusted by the first, decided to wait on the streets, ready to join in whenever called upon; and the third tried to put together some socio-political advances, but they just never figured out how to keep the movement intact. On the other (far) side, there was the bigger crowd: Average Egyptians who never heard from any of these groups. Average people began paying attention, instead, to young people appearing on State TV talk shows claiming to be revolutionaries and preaching against any future protests. “See? Revolutionaries on TV are speaking against the people in Tahrir,” an average man would say, “so Tahririans must be nothing but rioters.” Then, before long, he'd run into another revolutionary on another channel taking the Tahririans’ side and conclude that revolutionaries must be just a bunch of confused kids and turn his back. Average people were scared by the military council’s repeated speeches about the near fall of the country’s economy. That’s no news. What is news is that people started using the term “Tahririan” as a synonym for spy. Egyptians had seen so much horror through the 18 days of the revolution that they became psychologically attached to the army. The thought was, “The army had kept its heavy hand off our necks, and thus saved the revolution.” It’s still a thought that's playing on loop at the back of most of Egyptians’ minds. The revolution became another "One Thousand and One Nights"; a good friend took to stenciling this phrase in his graffiti, tailed with a question mark and accompanied by an image of a mom taking a photo of her kid on a military tank. This was a year ago, in the days when we were at peace with the military. The Facebook/Twitter activists turned their backs on the streets. “Twitter celebrity” has become a moniker around town. “How is it going in the Twitter world?” I asked a famous twitter celebrity when I ran into him during the December clashes. “Good, good, how are you doing?” he replied. A couple of hours later I went back home and I found the tweet he was posting when I ran into him: “There are soldiers in the trees now!” He tweeted that after those of us on the street had already spent three days with soldiers holding positions on the rooftops of buildings in the area, showering us with rocks, stones, desk drawers (yes), dining plates and, every once in a while, a bullet to shoot a protester dead. There’s a video from those days that zooms in on a group of soldiers on one of the rooftops. One soldier is obviously having a nervous breakdown, hysterically picking out rocks from a box he has in one hand to throw at protesters with the other. A fellow soldier is seen trying to stop him by force, but the former soldier keeps breaking free from the other’s hold to go back to throwing rocks at protesters down below, over and over. That’s a scene to tweet and re-tweet. Little rumbles started going around after the clashes last November: “Maybe we should start arming the ultras.” The ultras, of course, are the hard-core football fans hailed as heroes during the clashes when, for five days and with great courage, they stood their ground in the face of non-stop attacks by the riot police and Central Security Forces. Ultras became the face of the new cult of resistance. When resistance became a goal in itself. For how long will the people hold their chests open to gunshots? I don’t believe our blood from past clashes has run in vain. After the December violence, with the substantial amount of shocking footage that came out, the “Kazeboon” (“Military Liars”) campaign took off. It’s a decentralized movement that aims to spread images of the Army’s brutality. Kazeboon’s call-to-action is simple: Print photos of the army's brutality and show them to your neighbors, or to the passengers on the subway; or set up a screen in a square or a side street in your neighborhood and project the footage. The campaign has blossomed across the country. Another campaign took off in-synch with Kazeboon. It’s called “Salasel El Sawra” (“Chains of the Revolution”). The organizers post each upcoming march’s meeting point, timing and route on their Facebook page with an attached map for the specific area of Cairo. Everyone is welcome to join in the march holding a sign with a friendly, simple, carefully chosen slogan. The aim is to hold the signs and march smoothly. The group’s page provides good answers for any question that average people on the street might ask a protester while marching. Sell the revolution! Another group started to hold nightly gatherings at Talaat Harb square, the core of downtown, hanging a megaphone from the hands of Talaat Harb’s statue and broadcasting revolution to passersby. These are campaigns that finally broke out of the Facebook/Twitter drift and rebooted the online world back to its original position of bringing the agenda for actual moves on the streets. The revolution has finally started to breed the new wave of activists it deserves: Activists who are successfully talking average people into joining the revolution. Street artists marked the ten days before the 25th of Jan anniversary as “Mad Graffiti Week” to reclaim the streets, but if you’re walking downtown, you won’t find a lot of new graffiti. Instead, graffiti has started to move out from the Tahrir area, with fervor, to previously unvisited neighborhoods all around the country. “Giving the military a million Tahrir Squares instead of one to fight” is the main goal now. It can only happen with the involvement of workers. In Suez, days before the anniversary, it was reported that seven separate protests merged into one strike blocking the highway, with marchers facing down an attempted military police crackdown, forcing the police to retreat. Through the past few weeks, other workers have started going on strikes in varying factories, highway and railway services all across the country. 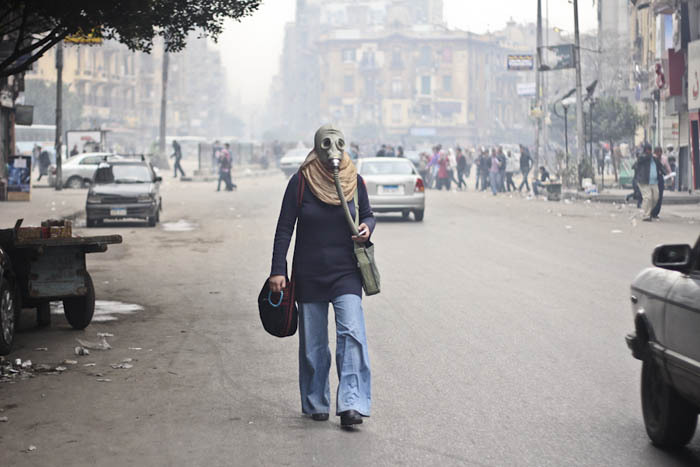 Back in February 2011, the phenomenon of workers going on a general strike comprised the last push needed to topple Mubarak, who fell three days later. We waited for the 25th of Jan with a hope, wishing for it to come true. The military waited for it with a nightmare, wishing that it wouldn’t. The 25th of Jan came to pass with hundreds of thousands on the streets. Half of downtown Cairo was occupied - something unprecedented, even during the revolution a year ago. Marches of thousands converged from every place around Cairo towards Tahrir, while other cities around the country witnessed protests in Cairo's image. Neither the military nor the police had attacked us as I began writing this piece. They seemed to be playing a game of “who can hold their breath the longest,” just like Mubarak played a year ago. Maybe, we thought, the military’s strategy was to leave us to our marches, long sit-ins and protests un-touched so we’d lose average Egyptians bit by bit. And by the end, eat one another up. The newly elected parliament held its first session on the 25th of Jan, and I couldn’t swallow watching the new members on TV wearing scarves emblazoned with the logo of the protest campaign “No Military Trails for Civilians” (some 16,000 Egyptians were put in military jails over the last year). To me, they looked helpless. They looked like they didn’t realize the power they had in their hands. The “No Military Trials” logo should be on my chest walking down the streets and protesting. Parliamentarians should be making laws and putting an end to it. The 25th passed, leaving us to the nights that followed, assembling all of us in front of Maspero (the State TV building). After a couple of nights, a real sit-in set in and Kazeboon started using a wall of Maspero to screen footage showing the military’s assaults - right in the face of that platoon of soldiers standing by the gates. Finally, Tahrir’s spirit is finding its new form: It’s no longer a sit-in waiting to be attacked so it’d react. Maspero is a vital building. Back in January 2011, the same army units wouldn’t have hesitated to shoot down protesters if they even dared approach Maspero. Listening to his theory of what needs to be done from the inside, I couldn’t help but be bugged by how much he expected us to wait on “them” – the military - to lighten their grip on power and censorship. Where was the “we” - in terms of “we need to do this or that…” The absence of “we” struck as weak and un-revolutionary. But just a few days later, I was shown the sense in his words. “Seventy Four Egyptians Murdered in Ultra Clashes following a Football Match,” was the news headlined on TV following the very same game everyone at all the cafes downtown had been watching (the reports had hundreds injured, with the police just standing by). Some people just kept going about their business without saying a word, acting like they weren’t hearing this. Some kept staring at the TV screen. Others reached for their phones and called friends, wondering what was going on. Around 3 in the morning, I ran into a group of 30 people marching down the street like dark, silent ghosts. They were marching to the train station to welcome back the ultras arriving from Port Said, where the match was. Suspicion ran rampant from that the violence had been orchestrated by the security forces’ hidden hand in retaliation for the ultras defiance in Tahrir. “I will only hold my football team’s flag, but not the Egyptian flag, ‘til I hear from my brothers and know what really happened there,” said one of the young ultras; he then launched into a chant against the people of Port Said, the city of the other team. “To hell with football!” replied other ultras. At the train station, there were thousands waiting for the returning heroes. There were ultras and non-ultras, activists and people who had nothing to do with football. Mothers, sisters and brothers came hand in hand, walking through the crowd with pale, dry red eyes; they had spent the whole night with no news from their sons. And they’d arrived, most probably, to hear the news of their deaths. The train came and everyone just flipped. We jumped across the tracks, racing to get to the platform. We started rocking the train as soon as it landed, while others climbed on top, stomping around with nowhere to go. Heroes came out, crying and screaming in pain, most of them having spent hours on the train screaming in pain. Some of them just walked away. From all the hugs, wishing they'd died with the others. “Say it loud! Don’t be afraid! Down with the military rule!” was the chant that echoed all across the train station from the moment they arrived. There was no hesitation about what to chant by then. The chants echoed with the mourners’ hysterical cries. All the returnees had a consistent story, and the videos emerging from after the match confirmed it: The massacre was orchestrated by the police and the military at several stages, beginning with not searching people entering the stadium (many were allowed to enter with unconcealed knives), then opening the playing field gates to fans of the other team right after the game ended, switching off the lights a couple of minutes later to send the whole place into dark chaos. It made perfect sense: The military and police were taking their revenge. The ultras were a bunch of kids who, with nothing but rocks and Molotov cocktails, had been defeated the police forces - with their rubber bullets, tear gas and live ammunition - time and again throughout the past year. As for the ultras’ role in the revolution from this point, it’s the end of living and the beginning of survival. Ultras and ordinary people and activists started marching to Tahrir the morning after the football massacre. Then, people decided to protest in front of the Ministry of Interior, venting rage at police. On Mohamed Mahmoud Street, which was a battlefield back in November, protesters found themselves face to face with an ugly concrete wall. After the clashes in November and December, the military decided to erect the walls to put an end to the fighting. Walls of huge concrete blocks, stacked one on top of the other. The clashes stopped back then, but the army kept the walls in place. Some people posited that the generals find them trendy. When the protesters came face to face with that ugly wall on Mohamed Mahmoud Street this time, we decided to take it down. Dozens gathered and started pushing, one concrete block after the other, until it was a pile on the ground. The police tried to frame the “rioters,” claiming we were trying to break into the ministry, claiming their forces were just defending it. But in the early morning hours of February 6th, riot police stormed half of downtown, including neighborhoods well away from the ministry. They chased protesters, shot some of them down, ran them over and tear gassed them. They arrested all the doctors at the field hospital and burned their medical supplies. They went wild, raining us with tear gas, rubber bullets and birdshot, sending people fleeing in horror, kids shot up with birdshot. And around every corner, mothers screaming. The parliament, dominated now by the Muslim Brotherhood, held an emergency session and ended up demanding investigations. Investigations were supposed to take place around the November clashes, in which there are allegations of chemical warfare perpetuated by the police forces. Investigations were supposed to take place around the December clashes and the Maspero clashes, where military tanks ran over protesters. And now we’ve got one more investigation. Don’t wait up for its result. It just might never come out. A call for a general strike starting February 11th is the word spreading on the street now. So far, student unions at some 40 government and private universities have announced support for the strike. And Kamal Abu-Aita, the head of the labor movement’s free syndicates’ union, has announced that the workers’ movement will be joining the strike en masse. And yet another campaign has taken off, calling upon people to boycott all products made by the military’s businesses and factories, from mineral water to basic supplies like macaroni. Ahmed Harrara, one of the icons of the revolution, lost one eye back in Jan 2011. and lost the other in the November clashes. Ahmad Badawi got run over by a police armored vehicle back in Jan 2011. But that didn't stop him from joining the recent clashes. He was shot and passed away on the night of February 5, 2012. Sometimes the police and the military act like they’re on a morning hunting trip, or in Hollywood, on a wild-west set. From now on, the street is the only place where we can be. Long live the revolution, for those we’ve lost along the way. Resistance is the only thing we got. General strike is the answer. Amor Eletrebi is a 23-year old poet and activist who has been participating in Egypt's revolution throughout the past year.